Is the counting method scientific? Yes! For many ecological studies, like studies of pollinators, scientific data need to be collected at lots of different locations, and at different times. However, to be useful for scientific analysis, data need to be standardised in some way. So the only way to standardise the data is by making sure the methods used at each time and location are identical. Why do I need to count pollinators on a day that is sunny, warm and calm? Pollinators are cold-blooded, so most of them will only be active when the sun is out and it is warm (above 15° C). Flies, European honey bees and European wasps are generally more cold-tolerant than native bees, wasps or other flying insects, so you will often see these on warmer days during winter. Why should I count for 10 minutes? Pollinators are quick to move between flowers, so the best way to get an idea of how many are visiting your flowers is to watch for at least 10 minutes. How do I know if I’m counting the same insect twice? You don’t always know! By watching the same flower, or group of flowers, you can drastically reduce the chances of counting the same insect, because you will notice an insect that ‘lifts off’ for a moment and then settles again. European honey bees are harder to count in these situations, because they often forage in groups, and individuals are hard to tell apart. But most native insects forage as individuals, or much smaller groups, so you should be able to keep an eye on who goes where. And the more you practice, the more you will get used to it! What if an insect flies past, but doesn’t sit on my flower? If you see an insect that hovers around one flower, and then sits on a flower next to it, you can count it. Hoverflies and bees will often do this, so it can be more efficient to watch a small group of flowers, than one individual flower. But don’t count insects that zoom past the whole plant without stopping. How do I know if an insect is pollinating the flower? You won’t always be able to tell, but you won’t need to worry about this for the count. Most insects that make contact with the stamens will probably carry some pollen grains away with them when they leave. To actually cause pollination of the plant, the insect will then have to make contact with the pistil (the female parts), which may be on the same flower, on another flower on the same plant, or on a completely different plant individual (see the Resources page for some great botany sites). But for the purposes of the Wild Pollinator Count, just count any insects you see on the flowers. 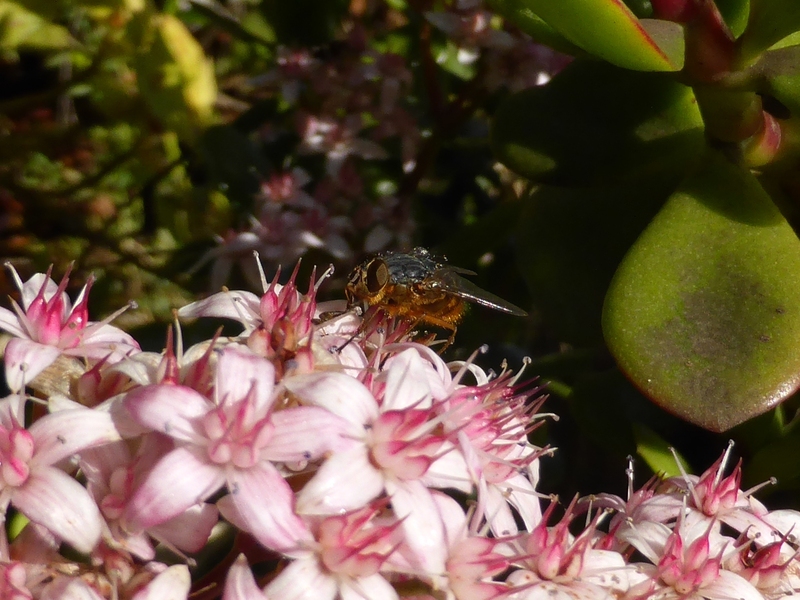 If you want to tell us anything more about your pollinator observation, you will have the opportunity to let us know in the Observational Notes section on the submission form. This is still a result! We can’t fully understand distributions and flower preferences of pollinators just from positive results. If we have records of flowers that have no insect visitors whatsoever, they can still provide important information on what pollinators don’t like. So you can still submit an observation with ‘0’ pollinators…and then do another observation! Can I submit a count outside of the official count periods? Unfortunately, no. Our methods are based on standard scientific methods to increase the quality of the data. It’s important that all participants collect their data at the same time. We encourage people to continue observing plants and pollinators in their local environment outside count periods! However, only counts conducted during the count week can be submitted and used in our data collection. Can I organise a WPC event in my local community? Yes! The resources we provide on the website are free to download. You don’t need to register with us or ask permission to organise an event, but please acknowledge Wild Pollinator Count when using our resources. When will the results of the 2015 wild pollinator count be made public? Hi Simon, we are collating results at the moment and hope to post an update this weekend. You can subscribe to our e-news list if you would like to be notified. Thanks! What is the difference between your count and http://www.beesbusiness.com.au/pollweekmain.html do you both share your information? We are an independent event and are not affiliated with Pollinator Week or Bees Business. Our results summaries and information resources on the website are available for anyone to use and share, as long as we are credited for original content. Hello, You can add birds in the ‘other’ category if they land on the flowers you are observing. However, we generally find that if you are close enough to the flowers to observe and identify insects, birds prefer to stay a little further away. You’re also welcome to note the presence of birds in the additional notes section, if they don’t make it into your count results directly. If you haven’t already, you might like to join the Backyard Bird Count, too. Happy counting!